Like Aroma Home? Click here to view the entire range. 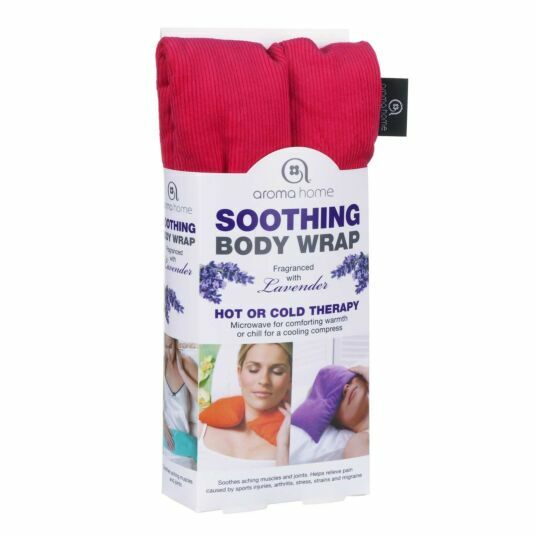 Soothe aching joints and warm yourself with this fuchsia microwaveable body wrap. Made from 100% cotton with a soft, velvety finish, the wrap is filled with and fragranced with lavender. It is designed to fit comfortably around the neck, over a shoulder, wrap around an arm or leg, or across the shoulder or lower back. Perfect for treating sports injuries or soothing sore tummies, this wrap can be either heated or used chilled as a cooling compress to reduce inflammation and relieve headaches. Simply heat it up in the microwave according to the heating instructions or pop it in the freezer for a couple of minutes if you require it chilled. This wrap is a great warmer, perfect as a gift for Christmas, especially for grandparents, gardeners and sports enthusiasts. Aroma Home offers fabulous gifts that are both fun and high quality. These scented and often microwaveable items are aimed to relax and enhance the senses of the user. Well known for HOT HUGS®, Fuzzy Friends®, Body Wraps and Screen Wipes, Aroma Home began with a focus on heated body wraps that combined muscle soothing with aromatherapy. They quickly developed further ideas, coming up with adorable kid’s items, and further microwavable products – from feet warmers to hot water bottles – that continued to combine simple home comforts with calming aromas. These special products are loved by all ages, and allow you to indulge in a little every-day pampering.